Vitamins – An Important part of a healthy diet	Vitamins support growth and development in children and teens. 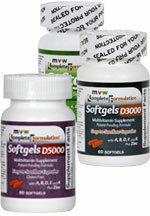 Vitamins play an important role in the health of all people. Ask your registered dietitian (RD) to explore your vitamin needs with you. Vitamin D – Important for bone health	It also helps the immune system, muscle function, cardiovascular function, respiratory system - for healthier lungs and airways. Are vitamin supplements a part of your care routine? Vitamin K – For your blood and bones	Vitamin K is important for building strong bones and maintaining normal blood clotting. Vitamin K deficiency may contribute to osteoporosis (soft bones) and tooth decay. Dark green vegetables like brussel sprouts have a lot of vitamin K.
Vitamin E – For overall health	Vitamin E, a fat-soluble vitamin, has antioxidant properties. Antioxidants help your body fight infections. Vegetable oils contain vitamin E. Ask your registered dietitian (RD) about other sources of vitamin E.
Vitamin A – For healthy eyes, skin and lungs	Vitamin A is important for growth and development, immune function and good vision. Good food sources of vitamin A are liver, leafy green vegetables, and dark yellow or orange produce like carrots, sweet potatoes, and cantaloupe. A healthy diet is an important part of your care	Eating a well-balanced diet containing a variety of foods is the best way to meet your vitamin needs. If your vitamin requirements cannot be met through food alone, you may require a multivitamin supplement. Ask your CF Center registered dietitian (RD) to determine which vitamin supplement is best for you. meet the Step 1 & with 5000 IUs of D3 and other fat soluble vitamins to meet the Step 2 increase in patients with low vitamin D levels. Great taste! 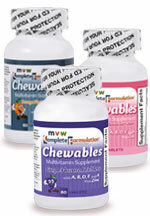 3 options for patients wanting a chewable - with all natural flavoring. Same product, better packaging. The package re-design provides a screw top, wrapped dropper and outer box. 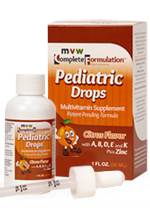 MVW Nutritionals is a privately held company, with the mission of providing leading edge nutritional supplements and vitamins for persons who have cystic fibrosis and other gastrointestinal disorders. Our goal is to deliver exceptional product profiles, coupled with outstanding service. We believe that quality in what we do, at a reasonable price are important, and are committed to this mission.